‘Tis the season to be sweaty, Fa la la la la… la la la la. This past Sunday the north pole came to Oxnard as a gaggle of runners showed off their holiday spirit (and a whole bunch of wacky holiday costumes too) as they trekked from the 101 highway down to the ocean in the 7th running of the Santa to The Sea Half Marathon. Costs for this Santa-centric race are quite reasonable as they start at $55 for early comers, climbing throughout the year, maxing out at $95 just before race weekend. 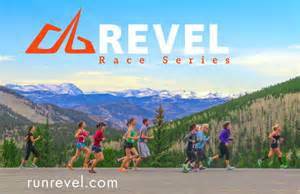 And the race does run specials/discounts throughout the year, so your inner Scrooge can smile as you’ll be sure to save a few dollars off registration fees. As for the expo/bib/shirt pick-up, the race offered several options. You could do the traditional “day before race” expo in Oxnard. Another option was to do VIP pick-up on race morning for an extra $20. For those of us in LA who didn’t feel like driving all the way to Oxnard two days in a row, the race organizers also had an early pick-up the week before in Santa Monica (a tradition I hope they continue). I, however, chose the final option which was to pay $6 to have my bib/timing chip mailed to me. I would get my race tech shirt at the finish line. Unfortunately, this turned out to be a bit of a problem as after the race I was told they were out of men’s shirts (grrr). But like Santa coming to the rescue, I met with the race director who took my info and said he would get a shirt mailed to me asap. UPDATE (12/17): The race director was swifter than Santa. The replacement shirt arrived today in the mail, in time for me to wear it this weekend on my long run. Thanks. Santa To The Sea bling! The swag for the race was pretty standard fare, meaning a finisher’s medal and race tech shirt. One nice twist is that the organizers let the runners vote (via Facebook) on various aspects of the bling. We got to decide on the color scheme of the medal as well as the ribbon design. As for the shirt, runners got to pick the color and short sleeved vs. long sleeved. The votes were tallied and the winning designs chosen. This year’s medal featured Santa chugging along, lugging the number “7” on his shoulder along with a green border surrounding him. The ribbon was a holiday themed green and red sash, complete with images of presents, ornaments and the race’s name. Not the most subtle or elegant medal you’ll ever receive, but it definitely radiated the holiday spirit. The 2014 race shirt was a deep green color with white stripes on the side and featured the race’s logo on the chest. The shirts were long-sleeved and they had crew neck versions for the “lords a’ leaping” and V-necks for the “maids a’ milking.” As race shirts go, it was a pretty decent design and again kept with the holiday theme. Transportation to the half marathon was pretty straightforward. Drive on the 101 highway until you get to “The Collection” shopping center in Oxnard where you park and catch a quick bus ride to the starting area. People running the 2nd leg of the half marathon relay took another shuttle from the start line to the midway point of the race. After the race, runners caught another bus back to the parking area. Parking is free at “The Collection” and the whole operation went pretty smoothly. 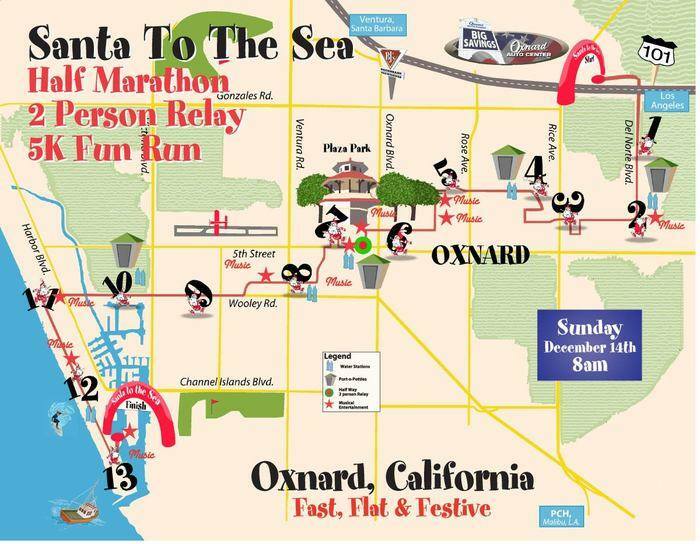 The Santa To The Sea Half Marathon features a “point to point” course… hence the “to the sea” part. You start at the big “Santa” located at Nyeland Acres (right by the 101) and meander your way down through the city of Oxnard until you get to the ocean (find yourself standing in waves and you’ve gone too far). The route is flat (with the exception of a freeway overpass or two) with twists and turns along industrial parks and neighborhoods making your way to the coast. Once you hit mile 11, you run along a seaside bike path for a mile or so before finishing near the harbor. Two things of note on the course: first off, at times you’re sharing the road with cars (runners have one side of the road). The course does intersect several sizable intersections with cars waiting to cross. Police and volunteers were on hand directing traffic and holding cars. But on more than one occasion I felt a little uneasy that an impatient motorist was going to try and “thread the needle” and jump the gun. Secondly, on some stretches of road the pavement was a bit beat up (lots of cracks/potholes). Runners need to be extra alert to make certain they don’t step on a crack and potentially twist an ankle (or break their mother’s back). Kudos to the over 500 volunteers who helped out with the Santa to the Sea Half Marathon (many of whom I saw handing out water). The services for the race were in keeping with its size and fairly basic. The course was dotted with water stops (and some energy drink) and Gu’s were given out at one stop near the end. Since it’s impractical to think a race of this size would be packed start to finish with fans, the race opted to create “cheer zones” along the course where locals gathered to give runners a nice motivation boost. I enjoyed running through each of the zones, high-fiving kids along the way. Given the meandering nature of the course, I was wondering early on if there would be enough signage out there to give runners sufficient heads up on which way to go. I definitely went with a lemming-inspired “follow the person in front of you” strategy. And while mile markers were present on the course, be sure to bring a GPS watch if you want to know your time. 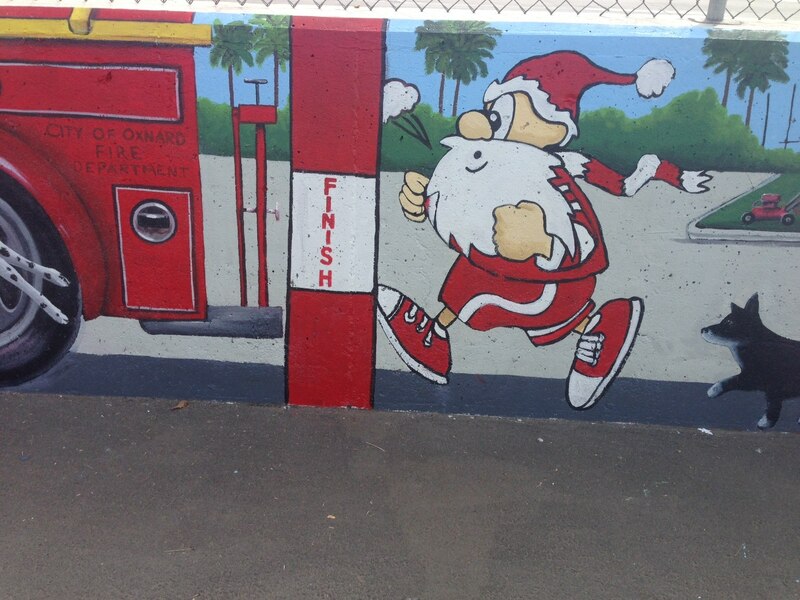 The Santa To The Sea Half Marathon did have a pretty good finish line area. After receiving their medals, runners were treated to a few drinks, fruit and snacks (I appreciated the homemade cookies). Runners could also visit the tented area to check out the race expo one last time. Spectators were also able to see many of the presents donated by the runners. NOTE: One really great aspect of the race was that each runner was asked to bring an unwrapped toy to give to local charities. As I approached the start line amidst the sea of Santas, almost every runner I saw was bringing toys or goods to donate. Well done runners! One other nice addition at the finish line was the race basically emptied out into the area for the local farmer’s market. So be sure to tuck an extra $20 in your running belt if you want to pick up some good home grown produce and local prepared food. Oh, and since the shuttle after the race dropped you right back at The Collection, you have the chance to do some quick shopping or grab a bite to eat (provided you’re not too sweaty or too tired to walk). I enjoy “holiday themed” races and the chance to break out goofy headgear (I opted with Santas on springs this year). Last year I ran the Holiday Half Marathon in Pomona, so it’s hard not to think of Santa To The Sea without comparing the two. In their defense, I’ll say each race has its strengths as well as areas where they could improve. But both are small town races, so you tend to be more forgiving with shortcomings as well as wanting to support the local running community. 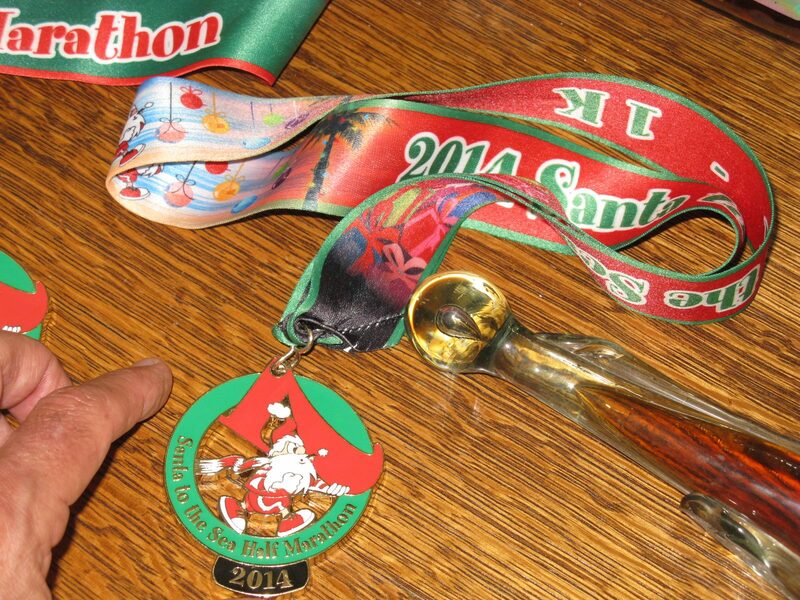 I’m glad I ran the Santa To the Sea Half Marathon. From the runners donating gifts, to the people decked out in costumes and the locals supporters cheering on friends and family (and strangers), I think the race succeeded in capturing the spirit of the season. 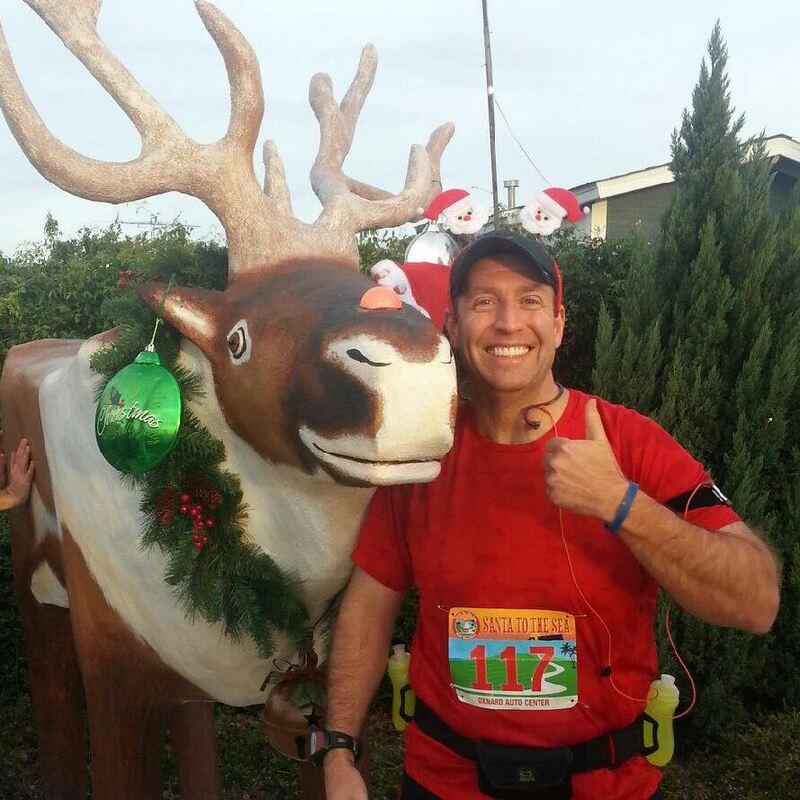 Posted on December 16, 2014, in General, Race Review and tagged Santa to the Sea Half Marathon. Bookmark the permalink. Comments Off on REVIEW: SANTA TO THE SEA HALF MARATHON.